In my role as a stepfamily coach and the administrator of several stepmom support groups I made a recent, painful self discovery. I am guilty of a serious stepmom advice sin: telling a stepmom: “ Don’t take it personally” I’ve said it many times to many women over my stepmom coaching career. Not until recently did I realize how serious my error was. And how incredibly hard “not taking it personally” was to do. Stepmoms aren’t supposed to take their stepchild’s rejection personally, or a high conflict ex wife telling the stepkids to hate you personally, or when your partner undermines your discipline in front of the kids personally. I was recently in the midst of my own stepmom pain and thought to myself “stop taking it so personally, this isn’t about you”. But I couldn’t stop taking it personally. What was happening felt VERY personal. And the behaviour was directed at ME. Here’s the problem. It wasn’t blatant. It was subtle, and in my opinion that was more damaging. I could feel the rejection and it was very real. And it hurt. A lot. In my opinion I couldn’t understand how I deserved this. But, I had to remind myself of something that I had repeatedly told myself in the past: I was a painful reminder to my stepkids that their family was over. Their family would never go back to the way it was. Marrying my husband and having more children changed their original family. It was hard to wrap my head and heart around the fact that my love and desire for a family, that was to include my stepchildren, turned out to be the very reason I was rejected. Here’s what I know. I didn’t deserve it. Not at all. And I always knew this wasn’t about me. I did in my mind at least. However, that wasn’t exactly true of my heart. So, then my next step was to figure out how to take what I knew in my mind and place it in my heart. Those two parts of my body felt at polar opposites to each other and that was going to be hard to reconcile. I had to do some research to know how someone else did it. (here’s a great article to read ). However, I had to make it specific to stepfamily life. But in the end, it was the hard, painful kind of stretch- yourself -out -of -your -comfort- zone work that I needed to do. Honestly, I’m not done with my personal work of following the tips below. In fact, if I am feeling vulnerable in general then I’m more prone to taking everything personal. Here’s what helped me. I hope it helps you. 1) A quick check up: do they treat everyone this way or just you? If this is their pattern and how they treat everyone then it’s not personal. If it’s only you, there are 5 other steps to take to insulate yourself. 2) Approval Denied: We think we need their (the ex or the stepchildren) approval. We believe we need to know they are ok with our presence. If they like us we win. We equate their approval with extra validity in our relationship with our partner. It means we are approved as a part of the family, it gives us legitimacy like a check mark on the list of building successful families. But our happiness should not and cannot depend on their approval. In our minds we know we aren’t a threat to them but they haven’t gotten that interdepartmental memo. We also need our CEO- our spouses- to send an upper management memo that respect IS not an option. Seriously, approve of yourself first. Be strong in who you are and what you bring to your family. Own your awesomeness and own your power. A key to this, if you KNOW you have been respectful to everyone and their process of adjusting to the huge changes that blending brings, you are golden. If not, you have some work to do on YOUR end as well. 4) Take a deep breath. Take 10 deep breaths. Replenish your bucket with self care activities. Baths or exercise, a good book, journaling, catch a comedy, nature walks, prayer, meditation whatever it is you need to build your wall of strength and create positive flow. And then actually do it: prioritize it, make it happen. EVERY. DAY. 5) BOUNDARIES!! Yes, stand your ground and be clear that their judgments, their criticism, their opinions, their values are theirs. 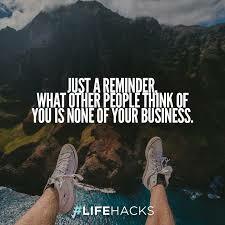 My favourite quote attributed to many authors over time is “What other people think of me is none of my business” You do not have to listen to their opinion or buy into it. Clearly they don’t care about yours. You can say what you will and will not allow from them. You do not have to deal with them at all, if that protects your head and heart. In fact, just ignore PERIOD! One of THE most profound “a-ha” moments for me came a few years ago when I was in tears talking to my brother, who is also part of a stepfamily. He said to me your stepkids don’t have to like you. WOW! What?! That is not what I was trying so desperately to accomplish. But it’s true. If they did not like me it doesn’t mean I was any less of a wonderful person with a good heart. It didn’t make me any less of a great wife and mother to our daughters. In fact, it held very little importance to me once I really thought about it. I know who I am. I had to start with insulating myself. I had to disengage. I set boundaries for myself. I refused to participate in many activities. Some were unavoidable, but it helped me to stop caring so darn much. It helps me find peace within myself, which then extends beyond me, to those around me. I trip up a bit on the love part but think of it rather as loving energy/vibes. So, on good days you may have to use one or two of these tools, on the not so good days, a combination of all of them. Know that this is a work in progress. In fact, that is a guarantee. So, the most important person to be gentle with is you! We all know about the fluid nature of steplife. If you are doing the job you have to of caring for your own well being and focusing on boundaries and positive re-framing, you are well on your way to letting the words and behaviors of others not affect you. That is where you will find your true peace and your true power! Peace to you in your head, you heart, and your soul!